Here are some of the festival highlights. The Unwrapped All Stars featuring Dennis Nelson turned current hip-hop tunes into soulful jazz grooves. Their set included “Candyshop” and Earth, Wind and Fire’s “Fantasy.” I wish I could name more of their songs but all of them were tight. Smooth jazz/R&B crooner Bobby Caldwell performed Ruby and the Romantics’ classic gem “Our Day Will Come” and the funky/soulful “Call Me Up” from his new album, Perfect Island Nights. The high point of his set was his R&B classic hit “What You Won’t Do for Love.” The crowd loved it and all sang along. He also included “Walk On By” and “Where is Love.” He closed with another hit, “All or Nothing at All”, which was also a hit song for Al Jarreau. Soulful vocalist Lalah Hathaway opened with her soulful ballad “We Were Two” and just got “Better and Better” from her latest album, Outrun the Sky. She said her remake of Luther’s classic “Forever, For Always, For Love” was “her first major hit in a career of over 15 years.” As soon as her band played the opening notes, the audience went wild with applause. People swayed and sang along while Lalah put down a serious groove. Her set also included “How Many Times”, a beautiful rendition of the classic gem “Summertime” and two Randy Crawford timeless tunes, “One Day I’ll Fly Away” and “Streetlife.” It was also very exciting watching Rachelle Ferrell standing on the sidelines cheering for Lalah. Nothing but love. Lalah will be playing the SFJAZZ Festival Fall Season with Marcus Miller on October 21. Dynamic vocalist Rachelle Ferrell came onstage wearing a fringed halter and white pants that made everyone take notice. She opened with “So Satisfied.” She had Lalah come out and join her on “Sistah.” It was so magnificent when they harmonized together, a hush fell over the crowd. It was magical. She sat down at the piano for “I Forgive You” and “Run to Me.” She puts so much energy into her music whether she is singing or playing. She performed a medley of her early hits “‘Til You Come Back to Me”, a chill out version of “I’m Special”, “With Open Arms”, “Sentimental”, and “Waiting.” We, the audience, were her faithful background singers. She closed with “Nothing Has Ever Felt Like This”, demonstrating her multi-octave abilities as she sung the low and high parts of this duet. The time moved too swiftly as Rachelle always she leaves you wanting more. As the evening the began to cool smooth jazz saxman Boney James set the audience on fire with his soulful grooves. Speaking of fire, he featured a sensational male vocalist on the song “Fire.” I will definitely have to check out more of Boney’s music. He performed Bill Wither’s classic “Ain’t No Sunshine” and he came back for an encore with Chaka’s “Sweet Thang.” He definitely gave us some sweet sounds. Just as the sun was setting on a hot day of music at the Greek Theatre, Kem came onstage like a cool breeze in the desert. His latest album, Kem Album II, was burning up the airwaves even before it was released. He blends his gospel roots with jazz, soul, and sensuality to deliver a sound that is very personal. His ballads minister to the soul while his mid-tempo grooves make you want to get up and dance or at least nod your head to the rhythm. His set included “Find Your Way”, “I’m Into You”, and “Heaven.” He definitely puts on a great live performance. This entry was posted on Tuesday, August 23rd, 2005 at 5:21 am. 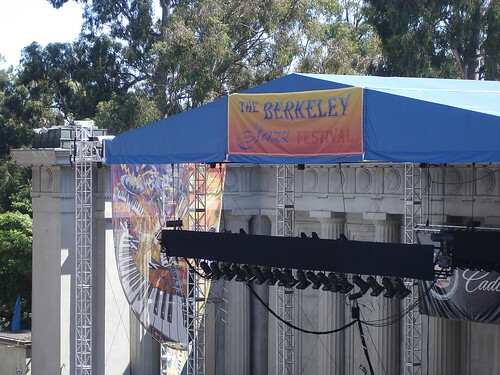 It is filed under Concert Reviews and tagged with Berkeley, Berkeley Jazz Festival, Bobby Caldwell, Boney James, Greek Theatre, Kem, Lalah Hathaway, Rachelle Ferrell, Ray Obiedo, Unwrapped All-Stars. You can follow any responses to this entry through the RSS 2.0 feed. Boney James AND Kem! Now you’re making me evil that I missed that show!